I finally read Peter Milligan's "Dark Knight, Dark City" from story Batman #452-454 in the form of the recent DC Comics Presents: Batman volume, and to add to the chorus of voices praising this story, I definitely recommend it. It is not, as it turns out, required reading for Grant Morrison's recent Batman work; as a matter of fact, Morrison's stories rewrite the conclusion of "Dark City," at least, rather severely. To read "Dark City," however, is to appreciate better how rooted Morrison's stories are in already-established Batman mythos; also, it bears mentioning, "Dark City" is a really, really creepy story, of a kind that readers of Scott Snyder's Batman: The Black Mirror are also sure to enjoy. For what I expect, in retrospect, from comics from the early 1990s, the three-part "Dark Knight, Dark City" is surprisingly violent. Equally surprising is that Milligan's villain in the piece is the Riddler; even Batman remarks at one point that he thought he and the Riddler's antagonism was built on respect and one-upsmanship, and not on the Riddler trying to kill Batman. Or, at least, the Riddler puts Batman in increasingly dangerous and grotesque situations, not the least of which is when Batman is forced to give a tracheotomy to a newborn baby. The concept is gross enough on its own, and Milligan keeps building the levels of macabre to the story's conclusion. What we learn in the end is that the Riddler's actually being controlled by a ghostly bat who died, along with a young woman, in a botched eighteenth century demon-raising. Batman's trials, though bloody, weren't meant to kill him, but rather to prepare him through rites for releasing the girl and the bat's spirits. It's here that Milligan's work and Morrison's derivative diverge; the bat-ghost here is not the demon Barbatos (rather, perhaps, just a large bat), and Batman and the ghosts part on friendly terms, whereas in Morrison's Batman and Robin Must Die, the bat is Barbatos (slash-Darkseid's Hyper Adapter weapon) and he merges with Simon Hurt toward the mayhem found in Batman RIP and The Return of Bruce Wayne. The difference robs neither good story of their impact; indeed "Dark City" is a kind of ghost story told 'round the campfire, which ends pleasantly enough even if it's rather scary getting there. Part of what's scary is the ghost-bat's presence, which haunts Batman throughout the book in a "someone's watching me" sort of way. The bat's corpse has been in Gotham long enough that it's seeped into the soil -- the bat is Gotham, in essence -- and this leads Batman to wonder if some corruption in the city itself lead to his parent's murder and Batman's creation. It is part and parcel, exactly, of the same kind of corruption of Gotham that Scott Snyder begins to establish in Black Mirror and continues into his New 52 Batman book; it'd be a kick, frankly, if Snyder (who's taken over from Morrison, in my mind, as the "lead writer" of the Batman titles) might also give "Dark City" a direct acknowledgment in one of his stories as well, as Morrison did. Artist Kieron Dwyer's work seems familiar to me, though looking back I can't claim to have seen it in more than just a half-dozen or so Superman issues. It nicely evokes for me, however, the Batman style of the early 1990s, not unlike Jim Aparo's -- the characters are clear, present in the panel, not distorted in any way like artists portray the characters today; I neither favor one nor the other, but there's something refreshing about the character clear on the page, in the vein also of artists like Dan Jurgens and Jerry Ordway. Dwyer's depiction lends itself to the characterization of Batman at the time, as a public superhero fairly familiar to the police; this Batman, with yellow bat-shield, is more often on the page and visible than he is hidden in the shadows. This DC Comics Presents edition also contains the one-shot Detective Comics #633, in which an addled Bruce Wayne seems to be the only one who remembers he used to be Batman -- even with another Batman running around. With art by Tom Mandrake, the story has an equally Hitchcock-ian feel as "Dark City." I couldn't guess the ending, which is a point for Milligan; there's a double-dream sequence that I found confusing that maybe lowered my estimation of the story a bit, but another reader might not have the same issue and love it. There are no covers included in this DC Comics Presents volume; I haven't read many of them so I'm not sure if this is common, but it felt like a significant omission to me. I won't go into my love/hate relationship with DC Comics Presents here, but this was a way in which I felt the volume could have been improved and lacked as a collection. As the original "Dark Knight, Dark City" issues are hard to track down, however, that shouldn't stop the reader from picking up this book. I've enjoyed what little I've read of Peter Milligan's work (namely his Infinity, Inc. relaunch) and DC Comics Presents: Batman: Dark Knight, Dark City was a story that actually lived up to all the hype I've heard about it; I thoroughly enjoyed it. Milligan has at this point already come and gone from the DC New 52 Justice League Dark, but I look forward to reading something scary from him nonetheless and his additional work that follows. Up next: the Collected Editions review of the final pre-Flashpoint Batman and Robin collection, Dark Knight vs. White Knight. Don't miss it! I have the original issues of this, but haven't read them since they were originally released. I do vaguely remember the story though, and in particular that tracheotomy thing is something that I've NEVER forgotten; every time I see someone choking on a movie or TV (never in real life, luckily), I remember that scene with Batman! After reading the Doom Patrol Blackest Night tie-in issues, which featured the Metal Men in a (non-BN-related) backup story, I hunted down and found the DC Comics Presents: Metal Men 100 Page Spectacular that featured all the Metal Men backup stories from Doom Patrol. Personally, I think while a true trade paperback would be better, if given a choice between this kind-of-collected-edition and no collection at all, I'm more than happy to pick these up for $7.99. Oh, and the Metal Men book didn't include covers either. Finally, you have a typo in the article: "Batman #452-545" should be "#452-454". These DC Comics Presents volumes never reprint full covers, which is a shame, but it made reading the "Metal Men" DCCP much more enjoyable. #633 sounds a lot like "Perchance to Dream," one of the best episodes of B:TAS. Is the similarity superficial? @Zach: "Perchance to dream" was based on the said story here, in which iteration it is called "Identity Crisis"
@CE: The covers were by Mignola, as brilliant as Kieron's interiors, I own the singles, and it's a shame if the covers weren't reprinted. The remaining of Peter Milligan's stellar run on Batman (around 15 issues distributed between Batman & Detective at that time, most art by Jim Aparo) is just as weird and unsettling. But for really good Milligan you owe it to yourself to check out the VERTIGO runs of SHADE THE CHANGING MAN and HUMAN TARGET, now that (as far as I know) both are integrated into the DCU. Human Target is integrated into the DCU (is that a New 52 thing?) or just Shade? I can't say where Shade fits into New 52 continuity because I'm trade-waiting so it'll match my Starman Omnibus collection, but my understanding was it exists in this nebulous pre-Flashpoint continuity, much like "Batman Incorporated: Leviathan Strikes!" But I didn't think "Human Target" was anywhere near continuity; i always assumed it was more of a tie-in to the short-lived FOX TV show. You'll probably realize this on your own, but Aalok meant Shade, the Changing Man, created by Steve Ditko and whom Peter Milligan (writer of Dark Knight, Dark City) wrote to some acclaim. Milligan's Shade was a Vertigo character, but with the DC New 52, Milligan's writing Shade again (or was) in the pages of Justice League Dark. Human Target is a character who originated in the pre-Crisis DC Universe in back-up stories, miniseries, and specials, before going on to a couple of TV shows and some Vertigo publications; Milligan also wrote some Human Target. Pre-Crisis, Human Target interacted with the DCU (once impersonating Bruce Wayne), but I don't think he's been seen in continuity post-Crisis. I started writing this at first to comment on the DC Comics Presents format along with the previous Batman releases and this led to me looking into the gaps that exist in the Batman comics. So just a heads up that I may meander a bit. I trade wait. I buy my books usually at local used book/discount stores or at conventions when I can get some great deals. As such I didn't get the original three Brubaker DCCP releases since I figured they would be compiled into a trade eventually (I still hope so!). I didn't grab them because unfortunately the format in not ideal. I'll echo CE's point that unlike trades, these collections will not be around very long. They don't have much shelf life since they are published in more of a monthly format. Given their nature and how I buy my trades, I most likely will have trouble tracking these down locally. Ultimately the trade collector in me is left unimpressed by these releases. If you look at Batman and Detective Comics, there are basically four major gaps of uncollected modern Batman material. In general Batman has been better collected than Detective Comics, but these gaps almost match each other. There is a significant amount of the Barr/Grant/Breyfogle/Davis/Wolfman/Aparo/Milligan (in varying combinations of these creators) that is not collected. On the Batman side there are collection such as Many Death of Batman, Ten Nights of the Beast, Lonely Place of Dying etc, but there is still a good chunk of great done-in-one stories and short arcs that are not. Detective is even worse with most of this era not collected (it's only Blind Justice and Year Two that I believe is). Maybe it's more sentimental that anything else, but this was a great era of Batman stories. To me it feels almost like a mix of the silver age and what ultimately became the modern age, before things when all 'extreme' in the 90s. Just good old classic Batman stories. 3.Legacy to Cataclysm/Aftershock/Road to/No Man's Land there is a large gap. I know that Aftershock and Road to No Man's Land were never collected which is odd given that all those stories are really single long two year crossover, but this is not the material I'm concerned with. Most of this era is the Moench/Jones/Dixon stuff. I'm less familiar with the Moench/Jones and Dixon stuff that hasn't been collected as part of some crossover. Is it any good, anyone have some insights? If DC were to put out a collection of this stuff in the future, should I be excited? That being said, my shelf goes from Knightsend to Cataclysm, so there is a fair bit of material that I'm missing. It may be great stuff, it's simply foreign to me. For this era, if the DCCP Brubaker material were to be collected in a trade, it would more or less complete the Batman stories. Unfortunately the same cannot be said for Detective. Evolution begins to collect some of this material and then nothing. There's a gap from 751-765 (not including the odd issue that was part of a crossover). If DC were to put out a DCCP Rucka collection (or again ideally a trade) this would take care of this gap. Though with what seemed like a messy breakup between DC and Rucka (at least to the outside observer) regarding Batwoman, I'm not holding my breath. There's also a story that Brubaker did after Fugitive called Dead Reckoning (777-782), that's just asking to be put in a trade to close off this gap. Personally I'd love for there to be some trades that collect this material. Nothing would make me happier than to see the late 80s-early 90s material and the Rucka/Brubaker material collected in trades, but if DCCP is the way to do then maybe that's what needs to happen. Collecting Dark Knight, Dark City is certainly a start, but there is more work to be done. As an aside, I wouldn't mind if DC dove back into more of the pre-Crisis stories as well. Doug Moench had a run on both the books in the 80s which would make for some great collections. For some reason I really enjoy the Batman stories from the 70s and 80s, they remind me of Batman: The Animated Series I suppose. This post summarizes all the DCCP releases to date (at least it looks that way). 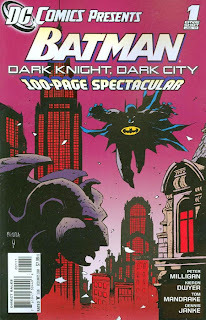 The above link shows that most of the Batman DCCP releases are reprints of the later LOTDK material (post issue 100). Again not crazy about the format, but is anyone familiar with those stories, are they any good? So far everything else that has been reprinted of LOTDK in trades has been really great. If these are solid reads I wouldn't mind tracking these down. I did a quick tally and between all the trades and these DCCP releases, a little under half of LOTDK has been collected. I think that's pretty good. Always would love to have more, especially the stories here and there that have not been collected pre-issue 100. Just wanted to share this with all of you and get some feedback. @CE: The most recent mini series featuring Human Target was written by Len Wein & art was by Bruno Redondo and to the best of my knowledge is not a part of Vertigo and bears the DC imprint. @magmadragon: The Brubaker/Rucka run, not so much but the Jim Starlin/Jim Aparo, Peter Milligan/Jim Aparo (though smaller than the rest) Alan Grant/Norm Breyfogle, Chuck Dixon/Tom Lyle/Graham Nolan and Doug Moench/Jim Aparo/Kelley Jones runs were excellent, mostly the Doug Moench/Kelley Jones were eerie done in one stories.